Who are these two men kissing openly in front of a church, above left? 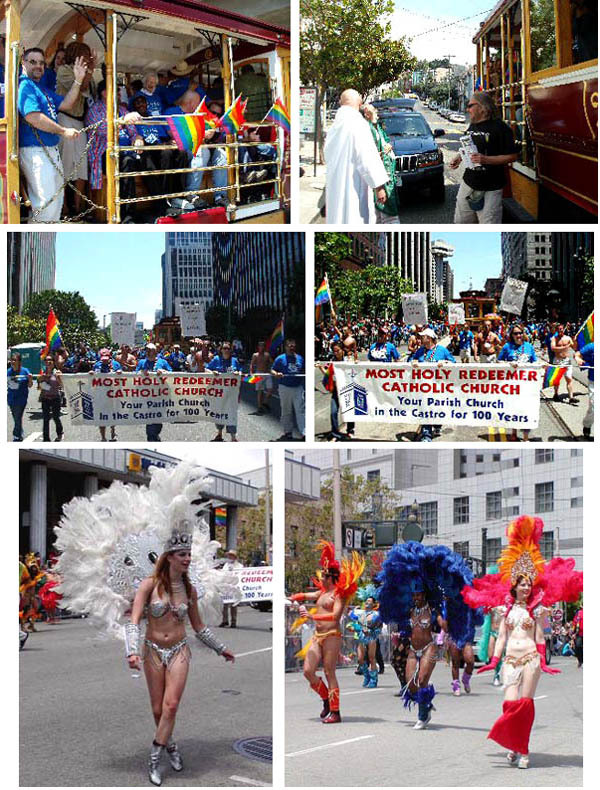 They are parishioners of Most Holy Redeemer Parish, in the Castro homosexual district of San Francisco. June 25, 2006, after Sunday Mass, their pastor, Fr. Steve Meriwether, above right, blesses them and other homosexuals who are getting ready to go downtown to march in the 2006 "gay pride" parade. "Welcome," the Internet site of MHR, as Most Holy Redeemer parish calls itself, invites all type of homosexuals, lesbians and transgenders, be they young or old, to take part in the parish life. Fr. Meriwether, who has been at MHR for four years, was a former Chancellor for the Archdiocese of San Francisco under Archbishop William Levada. the parish delegation to the "gay pride" parade; at right, homosexuals and supporters of different ages prepare to leave. Second row, the MHR gay representatives march in the parade.Third row, the homosexual contingency that immediately preceeded the MRH group.